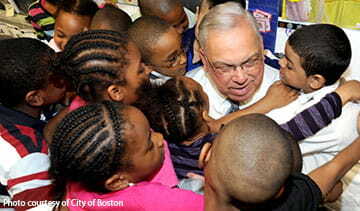 The Thomas M. Menino Fund for Boston was established as a way to ensure that Mayor Menino’s legacy would live on. Donations made to the Fund will allow the Menino family to continue to support the programs that Mayor Menino embraced and that helped so many. Visit the Tom Menino memorial website. If you have any questions about donating or if you wish to make a gift through a donor advised fund or of publicly traded securities, cash wire or mutual funds, please contact the Boston Foundation’s Fund Administration office at (617) 338-2213. Checks should be made out to the Boston Foundation with the Thomas M. Menino Fund for Boston in the memo field. To make a donation by credit card, use the form below.